To prevent recidivism in individuals who have been jailed for prostitution by encouraging character development and providing skills for an independent lifestyle. We understand the unique aspects of our diverse culture so we automatically provide all videos and materials in Spanish. In addtion, we utlize Spanish speaking course translators. Other language translators are also provided. “Entendemos los aspectos únicos de nuestra cultura diversa, por lo que automáticamente proporcionamos todos los videos y materiales en español. Además, utilizamos traductores de cursos en español. Otros traductores de idiomas también se proporcionan. Laugauage traducción proporcionada! Sin preocupaciones.”. 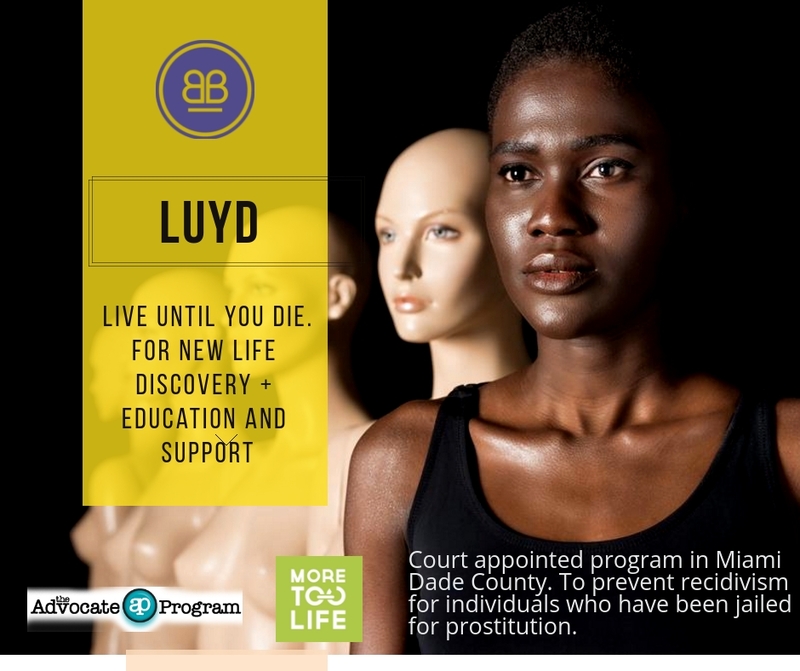 Live Until You Die (LUYD), created by Dr. Brook Parker-Bello of Youthiasm® founder of More Too Life, Inc. is a court-appointed, personal development program for individuals who have been jailed, or have re-offended, as a result of prostitution. We aim to serve prostituted offenders who may be victims of sexual/domestic violence, human trafficking and under pimp control, drug dependent, and mentally challenged, and other individuals under the influence of gangs, fraud or coercion. The program consists of an 8-hour course, split into 2 interactive sessions with the goal to prevent recidivism by encouraging a life change with character development through referred resources and personal responsivity, as well as skills that foster an independent lifestyle, while identifying invisible victims of exploitation and forced prostitution/human trafficking. The intent is also educating our participants on the history of prostitution and human trafficking and the childhood trauma often never dealt with, when the high majority of adult prostituted persons was raped, trafficked or violated as a child. Many of these women and men, including members of the LGBTQ community, may not realized that they have been victims and that the crimes they committed are often a result of their victimization. History of prostitution, identity discovery and personal development, moving beyond trauma, and regaining a feeling of trust and safety, understanding the power of the internet in human trafficking and encouraging cyber-security and digital integrity. Understanding human exploitation, breaking free from pimp/gang culture and the criminal activity behind prostitution, and how to avoid further law violations with one-on-one mentoring and assistance with life-building necessities is also for encouragement to follow through with needed resources, restorative justice, and possible relocation assistance. LUYD operates in partnership with the Advocate Program and the State Attorney’s Office in Miami’s Dade County, Florida.